Aimersoft DVD Library for Mac is a useful application for movie collectors to build your own DVD library on Mac to manage, sort and share DVDs. It can automatically retrieve the DVD's cover and all relevant info from Amazon, and playback collected DVDs on Mac without inserting DVD discs.What's more,DVD Library for Mac also allows you to legally backup DVDs to Mac and portable hard discs. Now manage your movies just the way you like. 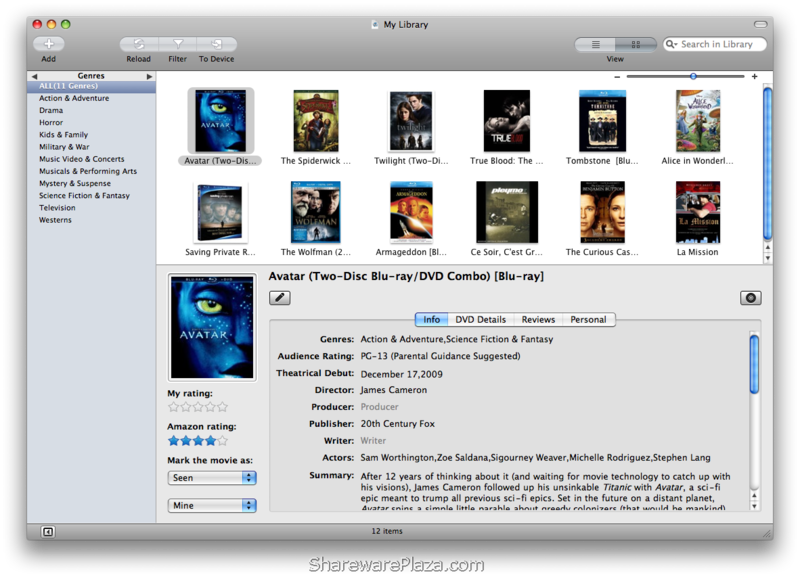 collectors to build your own DVD library on Mac to manage, sort and share DVDs. ...... information about your DVD movies from Amazon in real-time. You can also use the barcode scanner to add DVD info quickly. Build your own DVD library on Mac to organize your movies just the way you like. On Mac OS 10.5 and 10.6,display your movies with the DVD cover images in the grid view and browse them just like you would in a video store. You can find most popular DVDs or new releases on Amazon easily, and it will be marked as Haven't Seen and Haven't Bought category automatically when you add the DVDs to your library. Store each DVD movie's information to DVD Library, for example Director, Actor, Subtitle, Audio, Movie Rating, Release Date, UPC,and so on. To save you time and effort, DVD Library allows you to browse your DVDs by genres, actors, directors and years at left column browser. Qweas is providing links to Aimersoft DVD Library for Mac 1.0.0 as a courtesy, and makes no representations regarding Aimersoft DVD Library for Mac or any other applications or any information related thereto. Any questions, complaints or claims regarding this application Aimersoft DVD Library for Mac 1.0.0 must be directed to the appropriate software vendor. You may click the publisher link of Aimersoft DVD Library for Mac on the top of this page to get more details about the vendor.